I've been in my apartment for a little more than a year and a half, and still struggle with the anxiety of hanging things. Why you ask? I have no idea. The indecisive way I decorate may be the reason I have trouble putting holes in the walls, or the little fear and anxiety in the back of my head that still can't believe I picked up and moved to Arizona on a leap. Seriously boggles the mind. I have an extremely long wall in my apartment, that has been left untouched since move in day. I'll often sit on the couch watching TV, and my eyes will trail to the unnecessary white space hovering in the room. I'll try to imagine what on earth I'm going to do to fill the space, which usually leads to pure frustration. I finally thought to myself, enough! And caved on the idea of a gallery wall. I had one in my college apartment a few years ago, so I haven't felt the urge to duplicate the effort, even as the gallery wall swept through the interior design/blog world as the must-do trendy thing to make your apartment chic. Welp, guess this makes my apartment trendy and chic. 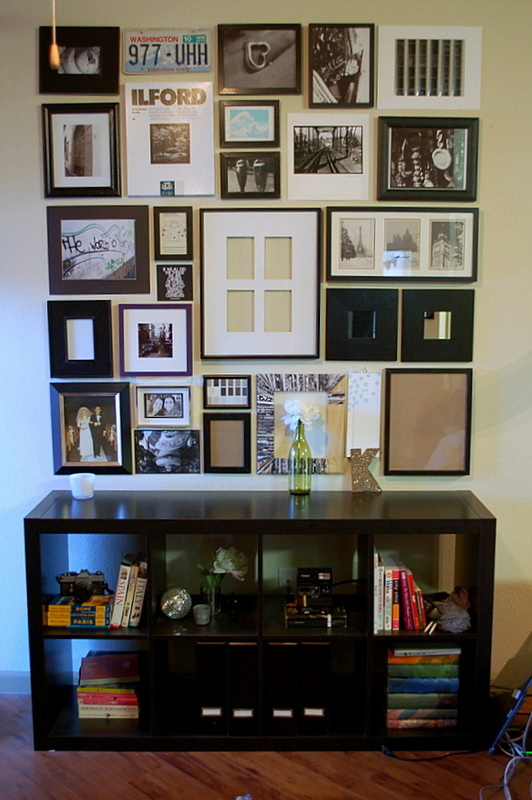 I had a large space to fill, and knew from experience that eyeballing square frames on a wall is an absolute nightmare. My mom and I have memories of a full day of arguments to prove it, since she was the lucky one to help me move in to my first apartment at WSU. I mapped out the area I wanted to use with old Trader Joe's bags, making it as even and square as possible. This is the template of space I was working with, just needing to find the perfect items to fill the interior. The paper bag outline/template came down off the wall so I could play around with the frames I pulled from various places around my apartment. Mostly out of boxes. Clearly I'm a hoarder. Tetris skills are a big help here, since I arranged and rearranged the picture frame puzzle pieces entirely too many times to count before settling on a pattern that I liked. Once I did, I traced around the frames with a pencil so I'd have a guideline of where to place the nails. A few frames at a time, I'd pound the nails through the paper, carefully removing the paper around it and hanging the artwork. Tedious & slow, it helps to have some good music on! The entire project took me about three hours, spread over a few nights. Many of the frames are still unfilled, waiting for the perfect memory to be captured. The photos and art that are already up are a mixture of my black & white photos from college art classes, my mom's wedding photograph (my favorite photograph ever), photos from my travels abroad, and some of my favorite sayings. I'm so happy with how it turned out! Ignore the random garbage and cords. Clearly it's an illusion. Have you done any home improvement or DIY projects lately? Great idea! I never thought about mapping it out on paper first (seems so simple after you pointed it out). I also have been out here for about 1.5 years and I still have empty walls. Nails just seem so permanent. I promise mapping it out first will make your life SO much easier. It was great already having everything measured & drawn out before I started making holes in my wall! Thank you, Courtney! I'm so happy with the way it turned out! I have the same problem, it takes me forever to hang things on my walls! I really have to think about things and figure them out before I start hammering. Your wall turned out great! Thank you! I pretty much haven't hung anything else up, this is my one pride and joy. I'm not ready to make any more holes - to think this took me MONTHS to finally do! wow that template is a great idea!!! Makes life so much easier, I still messed it up a couple of times while teetering on my chair but I'm happy with how it turned out! Holy. Crap. This looks amazing!! I love your technique! I would have just started hammering nails into the wall and call it a day, lol. This looks awesome Katherine! I am the same way when it comes to hanging things - and I honestly have no idea why. We have been in our rental for over a year now and I still have several bare walls. This may have given me the inspiration I needed to fill the huge space in our living room!